After seeing so many adorable heart quilts over the past couple of years I finally started my own this week. 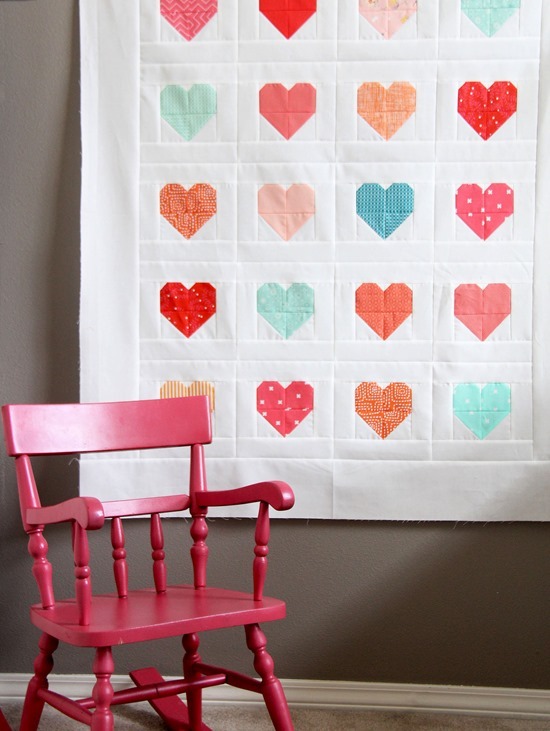 I have so many random sized pieces of reds and pinks that I’m ready to use up…so a heart quilt was calling my name. 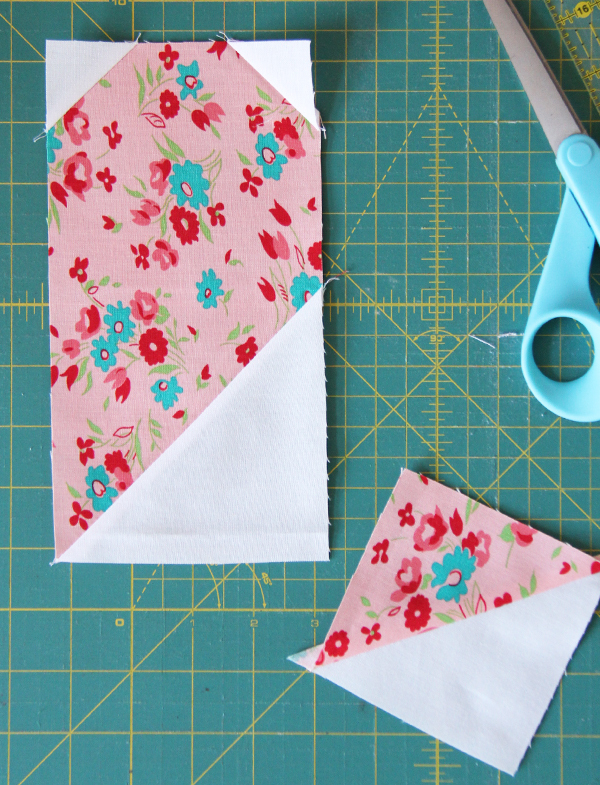 I’m making the 8″ finished blocks (tutorial here!). I figure if I make a handful each day I’ll have enough to make a nice big throw size without sashing within a week or two. 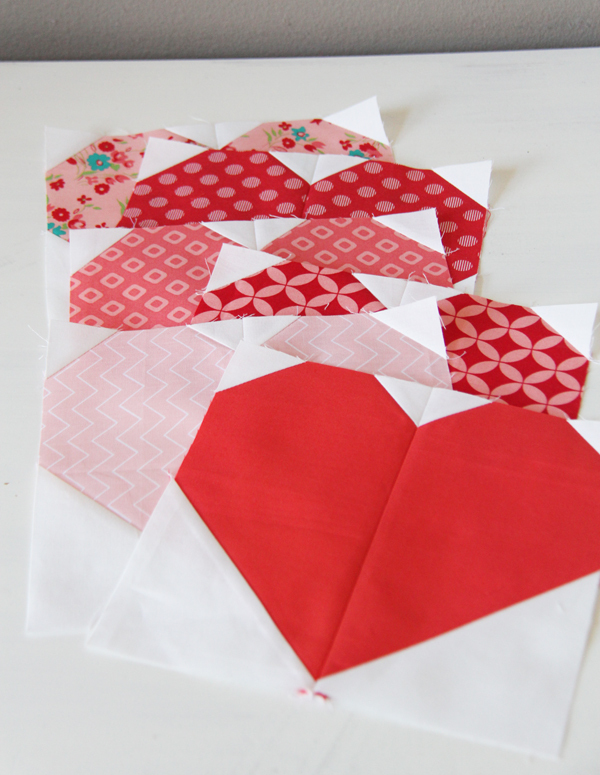 If you ever make these big hearts remember to use this tip here….and make an extra scrap HST you can use later! 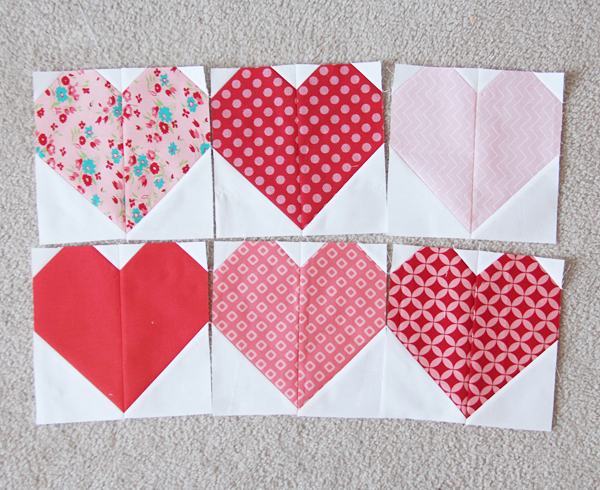 Since we still have a month until Valentines day, here’s a quick roundup of my past heart projects/tutorials! Bring on all the hearts. Have a great weekend! I’m making one now! I’m making 100 4.5″ hearts and then 2.5″ sashing. I think I bit off more than I can chew. Slow and steady. Instead of making a few hearts a day I’m doing them all together. So I just finished chain piecing all the 2.5 background squares onto the patterned rectangles. Next comes the 400 1″ squares! All these valentine hearts are so yummy! Fun to see. I’m hoping to finish up a hearts and chevron quilt this month. I’ve been putting it off since August! The piecing is done, just have one more row of quilting. Thanks for sharing these hearts to remind me! Lots of hearts. Lovely. I am still thinking whether I should make a Valentine’s cushion or not! Leave it for next year! Love the multiple sizing chart. Definitely precut friendly and a stash buster project for those random bundle left-overs, too. Thanks!! Super cute! getting into heart making myself….Those 8″ hearts are fun to make. I “heart” that pillow so much! 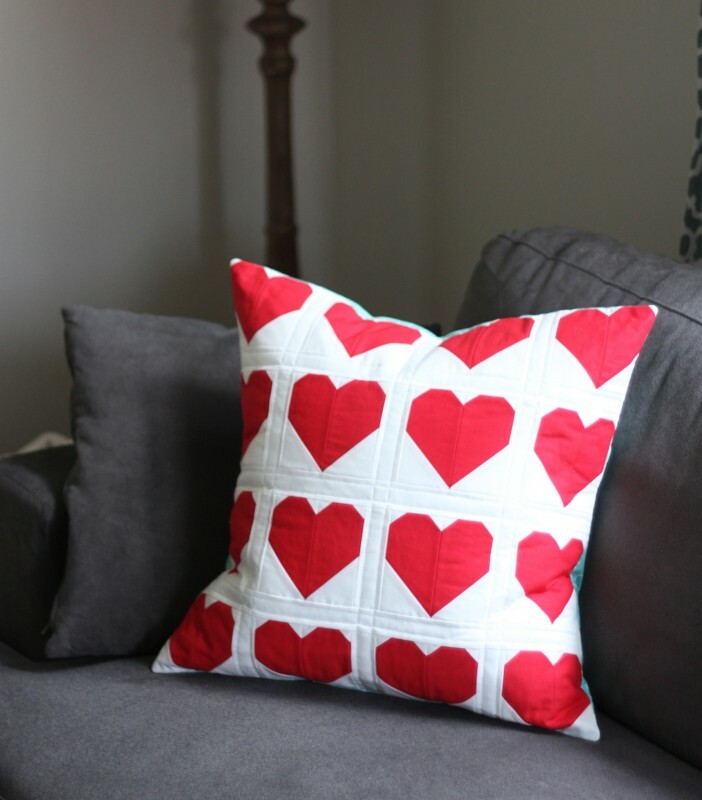 Your heart blocks and projects are always a favorite to make! Thank you, Allison!! That sounds darling! I love a good shortcut always. 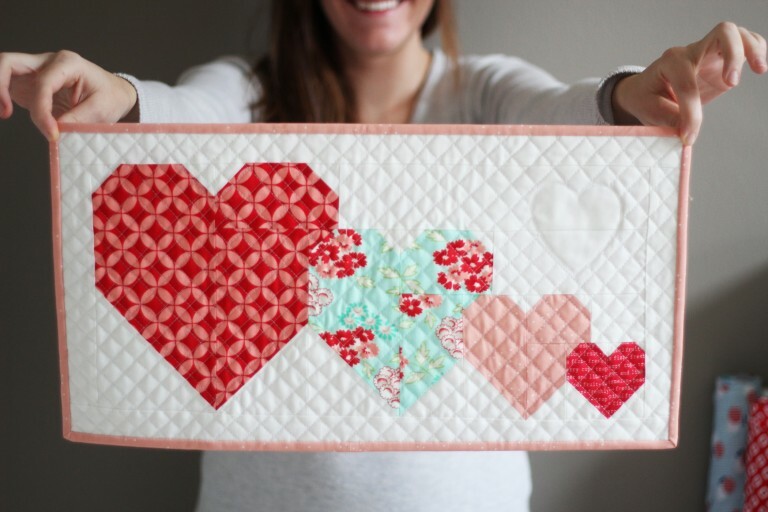 Can you direct me to the heart baby quilt on the blog? Oh so adorable! Love all your heart things…get it? Love…hearts…okay, I’ll stop! I love it all! Bless your little heart! 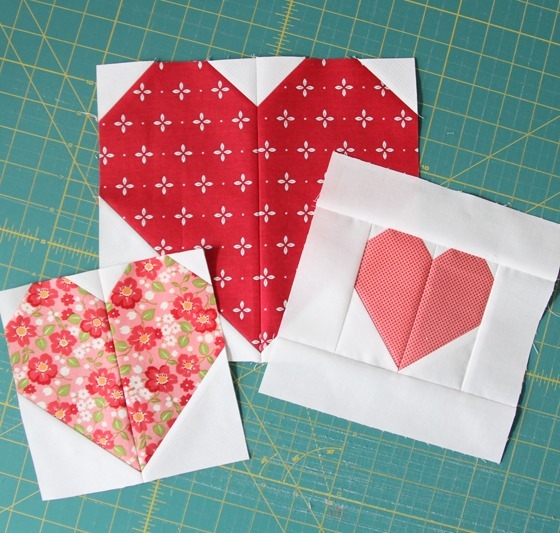 :) hey tho’, question: you did the heart block tutorial, but didn’t make a quilt of hearts??? I thought you had done one? I made your Hourglass quilt for my sister’s baby, your Sweet’n’Sassy one for my own daughter born in August and now I’m working on this heart quilt for when she needs a bigger one. I’ve decided to make the hearts plain bubble-gum pink and floral around them. I’m also making a set of hotpads for my sister’s wedding using this heart block.